The oxygen contains several stable isotopes among which 16O and 18O which are most plentiful (respectively 99 % and 0,2 %). This element is present in most of the natural circles (water, carbonates). When the sea water evaporates, the molecule H216O lighter pass more easily in phase vapor than the heavy molecule H218O. The steam has a deficit about 1 % of 18O with regard to the water of the oceans. The masses of tropical wet air are transported towards the poles and undergo successive condensations which impoverish them in heavy oxygen. Correlatively, they grow rich in light oxygen. The relative abundance 18O expresses himself by the parameter d18O (per thousand, normalized PDB). Either on the tests of foraminifères benthiques (temperature of deep waters). In cold period, there is enrichment it 18O some sea water (and thus carbonated tests). D18O is more raised. In warm period, there is impoverishment it 18O some sea water (and thus carbonated tests). D18O is lower. 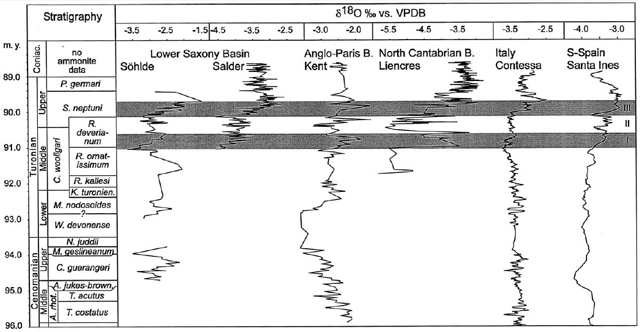 For example, limestones of Gubbio (Italy) or Caravaca (Spain) have values of d18O denials oscillating between 4 % (more warmly, higher marine level) and - 2,5 % (colder, lower marine level). The analysis of deep pelagic limestones supplies precious climatic data. The chalk is more problematic because it mainly settled on continental shelves enriched by contributions of fresh water and it underwent prematurely a strong bioturbation which reshaped her. The first studies compared of d18O between English chalks and Italian scaglia is due to Jenkyns and al. (1994). 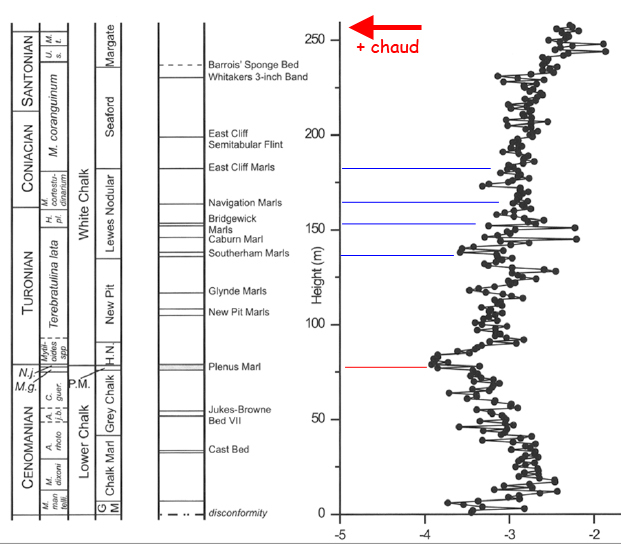 In the trainings thétysiennes of Himalaya (Wendler and al ., on 2009), we notice a general increase of d18O during the upper Cretaceous, thus the cooling of the temperatures. A reheating would occur in the limit Coniacien-Santonien or at the beginning of Santonien there, followed by a cooling in upper and average Santonien. Wiese and Voigt (2002) notices 2 phases of cooling during upper Turonien. They present a face which resumes various regional studies covering the interval Cénomanien-Coniacien. We can notice there that the curve of Jenkyns and al. (1994) for chalks of Kent show a reheating of the temperatures during Cénomanien until the limit CT from which the temperatures are globally going to fall. This observation is less obvious for other regions. We notice on this face of the "cold" values below and over marls Southerham.